My Disney Experience: How to Get FastPass+ times YOU want! 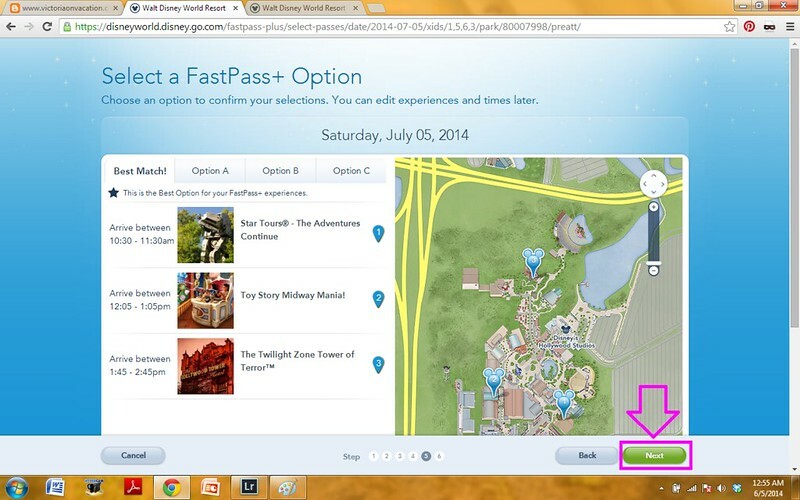 In this tutorial, you will learn how to make FastPass+ reservations using My Disney Experience, as well as how you can choose from all available FastPass+ arrival times when making your selections. Disney introduced the FastPass system in 1999 as a way for guests to "reserve" their spot in line. Rather than waiting in an hour-long line, you could get a paper ticket with a return window printed on it. You were then free to wait in line for other attractions, eat lunch, watch a parade, or even leave the park until your return window arrived and you were then able to enter the shorter FastPass queue for the attraction. Well, as of March 31, 2014, paper FastPasses are no longer being distributed, and the FastPass kiosks have been removed or replaced. Disney's FastPass has officially entered the Disney graveyard and rests among other greats - River Country, E-Tickets, and Dreamfinder to name a few. Paper FastPass tickets, may you rest in peace. But have no fear - Disney's FastPass+ is here! FastPass+ is an electronic version of the retired FastPass system. Rather than receiving paper tickets, Walt Disney World guests may go online or use the free My Disney Experience app to make three FastPass+ reservations per day. Guests who are booked at a Walt Disney World Resort hotel may make FastPass+ reservations up to 60 days in advance. Guests staying off-site and annual/season passholders may make reservations up to 30 days in advance. Currently, you may only make three advance FastPass+ reservations per day - no more and no less. However, after you have used all three FastPass+ reservations, you may visit one of the kiosks in the park to make additional FastPass+ reservations, one at a time, if available (you may also visit a different park and make additional FastPass+ reservations there). Also, at this time, you may only make FastPass+ reservations for one park per day. This works well for Magic Kingdom which has many attractions of equivalent popularity. However, Epcot and Hollywood Studios have a tier-system so that you must choose between popular attractions for a Tier 1 FastPass+, and then select two Tier 2 FastPass+. 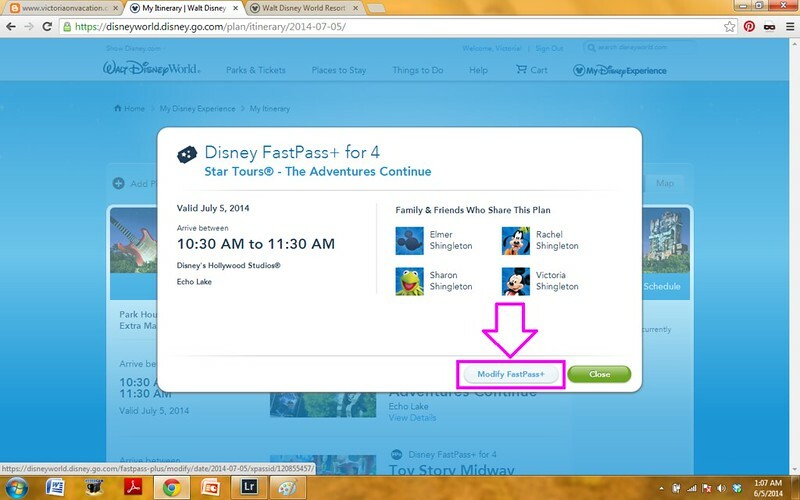 In order to make FastPass+ reservations, you must have a My Disney Experience account. If you are a registered member at ESPN.com or ABC.com, then that account will work for My Disney Experience. You will need to have your tickets and (if applicable) resort reservation linked to your account before you will be eligible for FastPass+. If you purchased your park tickets or booked your resort through the Walt Disney World website, this will require no additional action. However, if you purchased your park tickets or booked your resort through another source, check out my tutorial on how to link existing resort reservations to your My Disney Experience account. Log into your My Disney Experience account on the Walt Disney World website. In the top right-hand corner there is a tab that says "My Disney Experience". If you hover over this tab, a drop-down menu will appear. 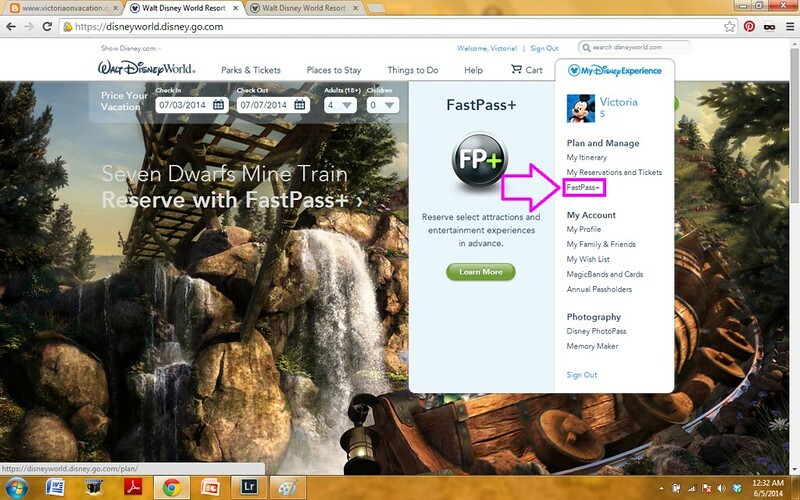 Click on the link for "FastPass+". Follow the on-screen guide to selecting a day, park, and FastPass+ selections. Depending on which park you select, you will either choose your preferred three attractions of all offered (Magic Kingdom and Animal Kingdom) or you will be prompted to select one attraction from the first tier of FastPass+ offerings and two attractions from the second (Hollywood Studios and Epcot). 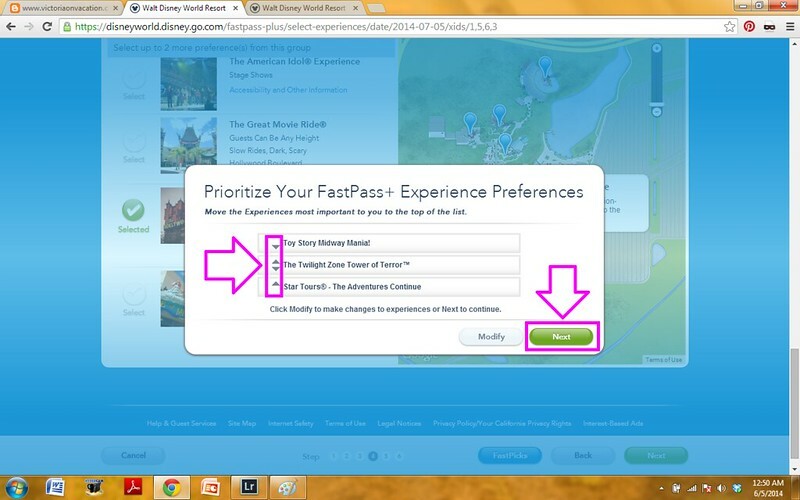 After selecting three FastPass+ attractions, you have the opportunity to prioritize your FastPass+ selections. There really isn't a need for prioritization, especially since we are going to change the arrival times that they assign us, anyway. You will be presented with three different FastPass+ options to choose from - Option A, Option B, and Option C. First shown is your "Best Match!" which is determined based on how you prioritized your FastPass+ selections. If you look at all three options, you'll realize that there isn't much customization available. You might wonder why if Tower of Terror is available from 1:45-2:45 PM, you can't have that time with the 3:05-4:05 PM Star Tours FastPass+. The answer is that you can... just not quite yet. Feel free to go ahead and look through all three options and choose the one with the times closest to what you want, as this will minimize the number of changes you'll have to make later. However, it doesn't really matter what you select here because you can change it in the next step. To continue, click the "Next" button in the bottom right-hand corner. You will then be sent to a screen that reads "FastPass+ Selections Confirmed!" It will list all three FastPass+ attractions with your arrival time. Underneath the attraction is a button that reads "Make Changes". Select "Make Changes" on whichever FastPass+ attraction you would like to change first. 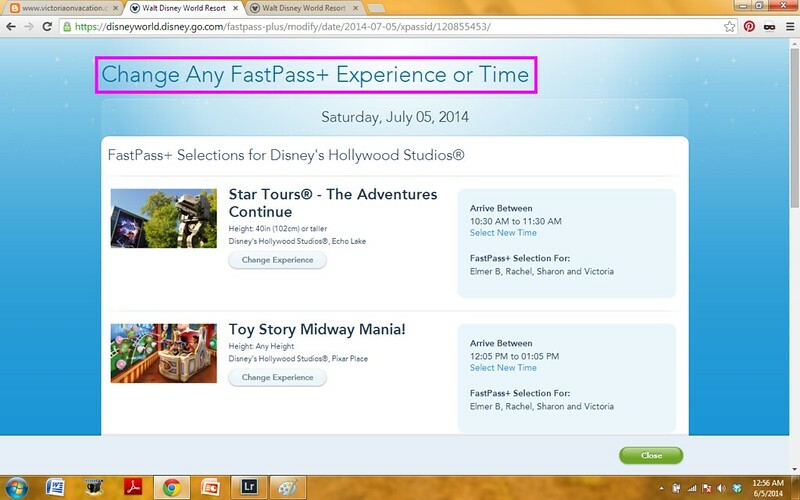 You will then be directed to a page titled "Change Any FastPass+ Experience or Time". This is the page where you will make everything exactly how you want it! Why they don't just send you here in the first place is beyond me, but let's consider this "our little secret".... at least for now. I had to scroll down to get the selection I chose to change first, The Twilight Zone Tower of Terror, to appear on my screen. Now underneath the "Arrive Between" is a drop-down menu from which I can select the time I'd like out of all available. To select your new time, just choose the time you would like from the drop-down menu and click "Update". Your changes will not be saved until you update your FastPass+ arrival time, and you will be prompted to "Update" before you can make any other changes. 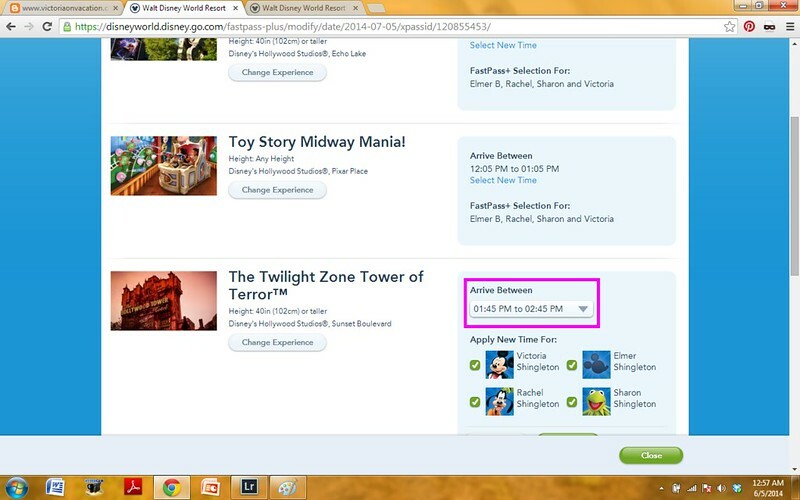 After changing the time for one attraction, you can then change another time by clicking on "Select New Time" underneath the arrival time for that FastPass+ attraction. Your arrival time will then be replaced with a drop-down menu from which you can choose your new arrival time from all available times. 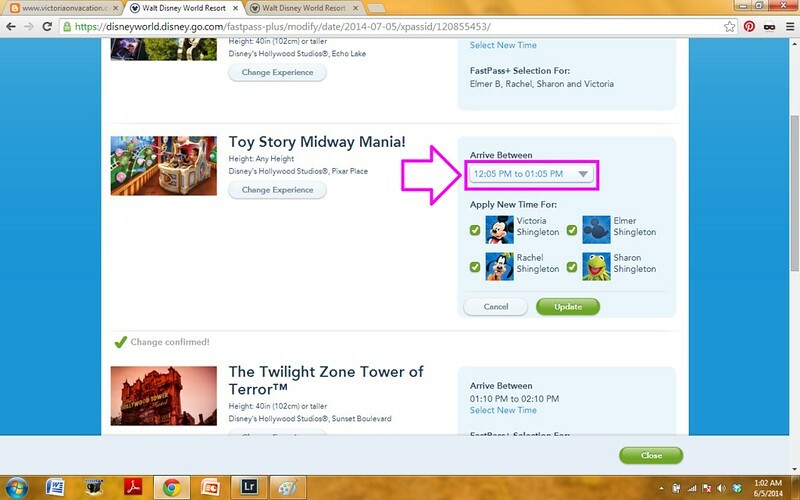 Once you are satisfied with your FastPass+ selections and times, exit the "Change Experiences" page by clicking the "Close" button in the bottom right-hand corner. 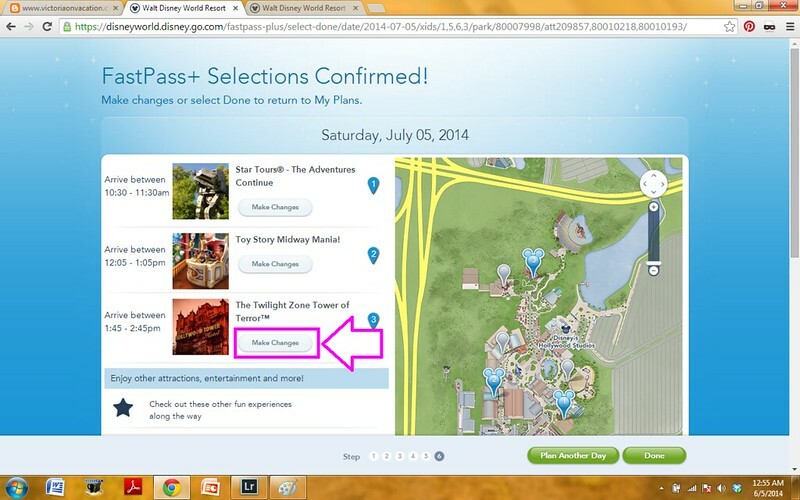 You will then be direct to a page which shows all of your updated FastPass+ attractions and times for the day. If at anytime you would like to make additional changes to your FastPass+ selections, click the "View Details" link underneath the attraction name. 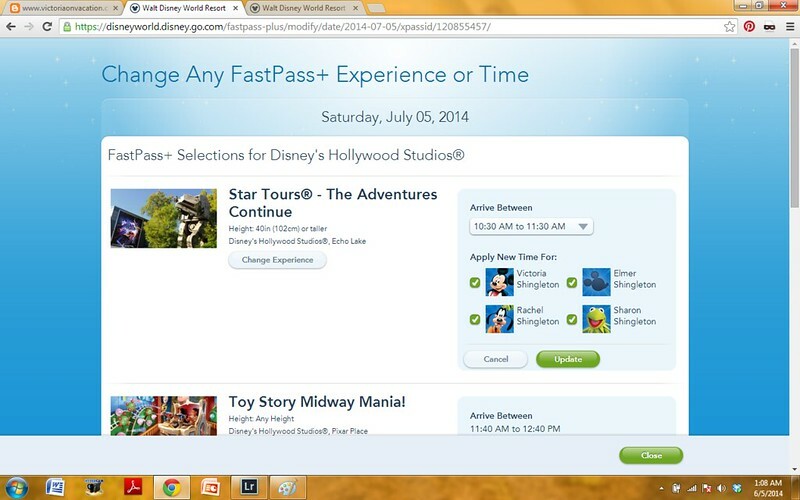 Which will pop-up a screen showing your arrival time and the people in your party with this FastPass+ selection. 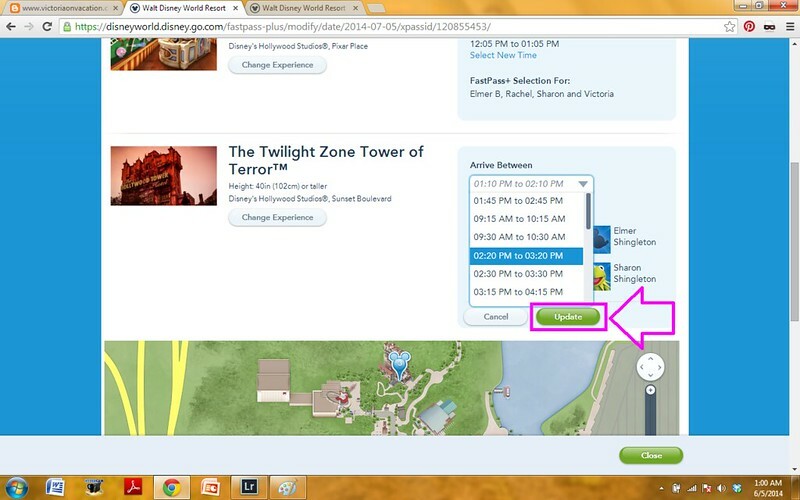 To make changes to the time or attraction, click the "Modify FastPass+" button in the bottom right-hand corner. 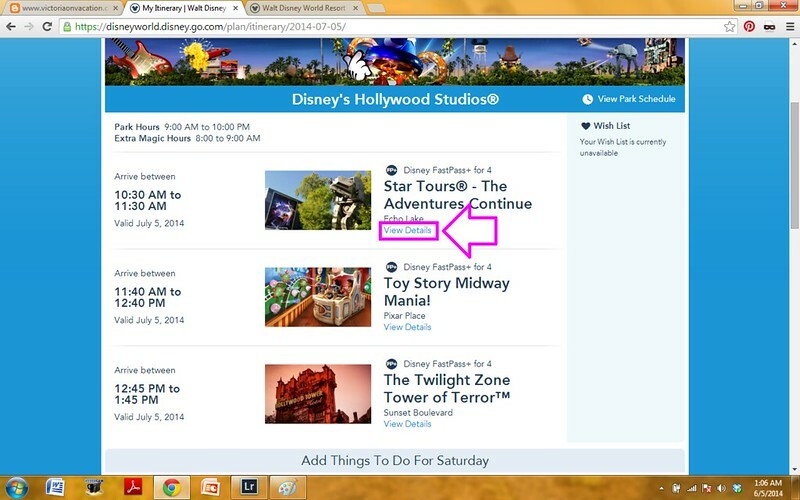 And that will send you back to our favorite "Change Any FastPass+ Experience or Time" page! You can continue to make changes to your FastPass+ times and attractions on My Disney Experience website or app until the arrival time of the FastPass+ you wish to change passes.